It’s long, but quite impressive as far as languorous adventures in the wild go. With lofty food for thought to go along with its visceral appeal, The Lost City of Z is an Amazonian jungle odyssey made in the respected tradition of “Aguirre the Wrath of God” and other 1970’s movies, and it’s made by James Gray (“Two Lovers,” “The Immigrant”) who makes it his obsession to make films that recall the rhythm and style, the classical tradition if not classical patience, of films that define the 1970’s. It tells the true story of Percy Fawcett (played elegantly by Charlie Hunnam), a British Army officer who was given chance to explore the Brazilian jungle in the early 1900’s – his diplomatic duty is to draw maps and define the Bolivia border that separates Brazil. He made several returning trips, constituting it as a life obsession, to not concentrate on border lines but to master the jungle and become the man who found the lost city of Zed. Percy does not believe in the El Dorado myth, but he does believe in something far more complex, and exotic, and revelatory about ancient tribes who inhabit these jungles. The film spends a great concentration on capturing the British aristocratic vernacular of its’ time, in the same way that 1970’s movies allowed characters to speak in long, articulate sentences. I must have had limited expectations on Hunnam (“Pacific Rim”) before this film, but it must have been a blessing for this actor to play a man of honor and high adventure, not of anything resembling a multiplex cartoon, but a man of poetic heroism. He speaks of dignity and ideals in the way that an early 1900’s Brit would have, or at least I’m convinced. Percy gets a partner in the shaggy but intrepid Henry Costin (Robert Pattinson), who is a lot more intellectual than he first appears and that allows for some very noble bonding. It is to my surprise that Pattinson adds a special gentlemanly addition to the film. Percy has a wife (Sienna Miller) who wants to be an additional partner on his quests, but he implores her to stay home to raise their young. The crucial second trip is the one that spurs Percy to go on, in the grip that his dream is close to realization, but having to disappointingly retreat for the better of his mens’ health. There are occasional great visionary sights in Gray’s film when we are immersed into the Amazon jungle. That is to be expected. But my mind keeps tricking me, because I cannot help myself from recalling “Aguirre the Wrath of God” (one of my ten all-time favorite films), and there’s only a few shots here and there that compares to that mystifying grandeur. 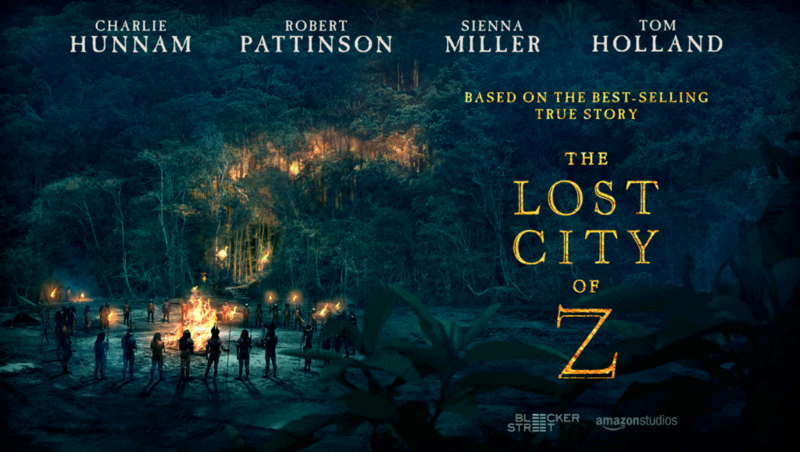 But “The Lost City of Z” is a committed true story, an intransigent one at that – it deals with a lot of the frustrations and setbacks of this man’s pursuits (and lets this dignified man make a lot of speeches about honor in what he is doing that are only a tad wispy), and the film does all that honestly. The occurrence of World War I also interrupts Percy’s true career of exploring – there’s also a feeling of agony that Gray had to somehow make this uneasy section, a great distraction really, congeal with the rest of the story. All of us should be so happy nonetheless, as moviegoers and readers of the 2009 non-fiction book by David Grann, that Percy got around to finishing his destiny, in the jungles where he was meant to be. We sense a firepit exhuming smoke that is beyond the river, beyond the torches, in the final shots set in the Amazon, and it’s a stunning visual moment. “The Lost City of Z” is well worth seeing. It’s a tonic in relation to the glut of homogenized blockbusters that came out this year. I cannot help but say though I admired the film more than loved it. In “Aguirre” and “Fitzcarraldo,” both by filmmaker Werner Herzog, or Roger Donaldson’s “The Bounty” where the hero of privilege goes mad, those impassioned characters compellingly went, well, overboard into madness. For a protagonist as obsessed as Percy, he sure had his head on straight over the course of many years. This makes it an epic of idealism that requires its own suspension of disbelief. Though you can’t fault Hunnam for embracing the part with such dignity. Film Cousins: “Aguirre the Wrath of God” (1972, Germany); “Fitzcarraldo” (1982, Germany); “The Bounty” (1984); “Silence” (2016).